NFL Free Agency Kicks Off Today at 4PM ET. The long awaited day is finally here. Offseason Christmas is upon us. After a very long month of waiting, we are going to be rewarded with some kind of Eagles-Related news. The Eagles will have no more reason to play coy anymore, if there are players out there that they want, they are gonna have to pounce on them. This is what makes the start of free agency so exciting. 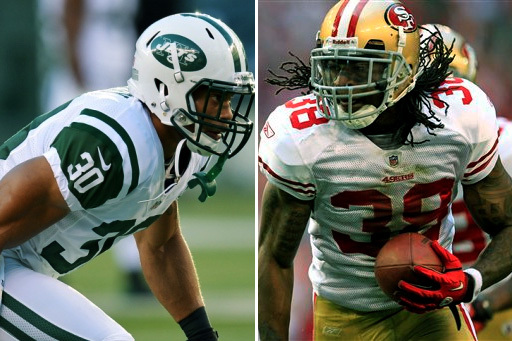 Word came out on the eve of free agency that the Eagles had interest in both SS Laron Landry and FS Dashon Goldson, which is great news for Eagles fans because it shows the Eagles are aware that they need help at both safety spots. As much as I would love the Eagles to sign both of these guys wield an extremely vicious safety core it just won’t happen. The will most likely only sign one and it is likely to be the SS Laron Landry. The Eagles need to be sure that they don’t go overboard this time around. The Dream Team spending spree of a few years back has left a bad taste in everyone’s mouth toward free agency. To an extent that distaste also struck the Eagles last year, who I believe did very little in free agency other than trade for Demeco Ryans. This offseason is very different, because the Eagles are starting over, they have to so many holes to fill they can’t possibly hope to fill them all through the draft, so they will need to sign at least 3-4 new starters via free agency. The last thing I want is the Eagles to go overboard and sign a ton of free agents that they really don’t need. In 2011, after landing Nnamdi, Jenkins, and Evan Mathis in free agency, I felt the Eagles had made some significant upgrades that would help the team, but the problem is that Howie couldn’t stop there. Vince Young, Steve Smith, and Ronnie Brown were soon brought in and did all they could to destroy what continuity the offense previously had. That situation was a disaster because they were trying to fit a ton of new guys into an existing scheme and culture during a shortened offseason. They were never going to jell that way and they never did. However this situation is different, because the team is starting over, what difference does it make if you bring in a small bunch of new guys and plug them into a system that is still being developed? They’ll be in the same boat as all the current Eagle players, and they will grow and jell together as they go along. If there was an offseason where you really wanted to make a splash and lay a foundation for the team you hope to build, it is this year. The Eagles will make some key moves, most likely just two very good starters and two underrated signings and that is good enough for me after starving in this offseason dessert for so long. Don’t expect them to do too much through free agency, they won’t sign 10 starting caliber players today, if they manage to land a quality safety like Laron Landry, I’ll be pretty happy with the direction this team is going. Who do you want the Eagles to sign? How sick would it be if they could sign both Landry and Goldson?